Everywhere, USA: If you think it’s absurd to compare the men and women in blue uniform to terrorists, just read the definition of terrorism. The Free Thought Project has compiled a list of 7 examples that shows why comparing police to ISIS is not so crazy. 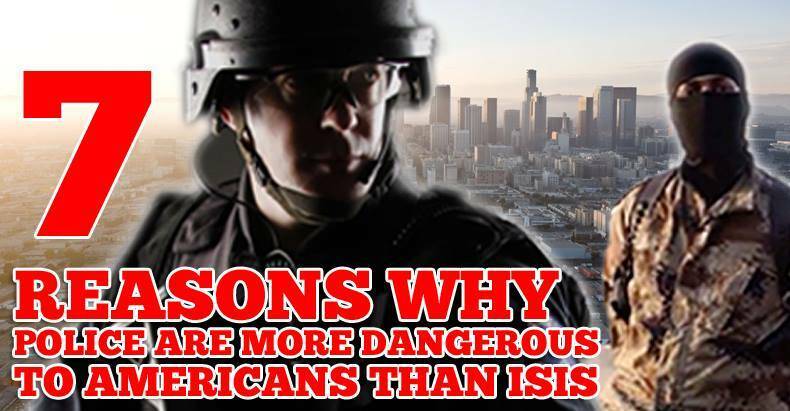 In fact, it proves that police are far more dangerous to Americans, and our freedoms than any terrorist group on earth. #7 The fact that the US government funded and essentially created ISIS, and the police are powerless to jail those who were responsible. While there are over 3 thousand people serving life without parole in America for nonviolent, victimless crimes, the people who gave Saddam WMD’s, armed the Mujahideen leading to the creation of Al-Qaeda, and did the same with ISIS, are free and clear to continue their war crimes and destroy an entire region of the globe. These people, a culmination of politicians, multinational corporations, and order followers, live right here in America. Yet the American people aren’t seeing any of them join the swelling ranks of the American prison population, because the police are incapable of holding anyone with any kind of political power, accountable. Although it is widely reported that the U.S. war on drugs is a complete failure and more immoral than drug use itself, the order followers in America will still kill you for possessing a plant. They will steal your hard earned money without an inkling of proof that the money is involved with the buying or selling of drugs. In fact, the biggest profiteers of the drug war inside America are the banks that launder billions of dollars for drug cartels. The banksters have been caught but not one person has been arrested, let alone gone to jail, and according to HSBC whistleblower Everett Stern, they are still doing it with impunity. Who else benefits from this law enforcement crusade that is the war on drugs? The drug cartels and gangs. They love the black market opportunity afforded to them by the illegality of their products. The drug war actually makes their enterprise more profitable, in turn making them more powerful, leading to more gang members and more violent crime. So, if it’s true that #BlueLivesMatter, then police would understand the true nature of the war on drugs and realize that it only makes their jobs more dangerous. The war on drugs is essentially a war on people and a war on freedom. Has ISIS waged a 40-year war on Americans? #5 Unlike the Chicago Police Department, ISIS doesn’t have a secret black site where they kidnap, and then hold Americans against their will, with no charges. It has been reported that members of the Chicago PD have held people at this prison for suspicion of possessing the most beneficial plant on the planet. This plant just so happens to cure children from epileptic seizures, cures adults with Crohn’s disease, and has been said to have cancer-curing properties as well as many other medical uses, which the mainstream media has admitted. Not only did the Chicago PD hold these plant-harboring terrorists against their will, it’s alleged they have tortured these inhabitants of the land of the free by dosing their victims with heroin, and another citizen reported being anally raped with a flashlight. #4 ISIS doesn’t work as henchmen for the largest prison population in the history of mankind. Enforcing every arbitrary edict in the land to maximize profits for just a few private prison companies who are paid with stolen money (taxes), this is the job of law enforcement in the land of the free. Because order followers don’t question any of their orders, it has lead to 65 million Americans (about 22% of the population) having criminal records. Many of these criminal records are because of simple drug possession. An individual with a criminal history finds it extremely difficult to find a job or a place to live. People become desperate for life’s necessities so they resort to violent crime and will get a job on the black market selling drugs, which will lead to more time in jail. This vicious cycle has become a phenomenon known only as recidivism. ISIS has no bearing on the recidivism rates in America. However, police could change it if they used their powerful unions and lobbyists to support solutions to this epidemic that is plaguing America, instead of profiting off of it. #3 You are 58 times more likely to be killed by a cop than you are ANY terrorist. That number is based on Americans that have died overseas from terrorist attacks. If you take the stats from terrorist attacks here in America, the probability of being killed by a police officer rather than a terrorist is much higher. American police killed over one thousand people in 2014 and have killed over 500 people thus far in 2015. These numbers are over double what the FBI has reported in the past, and we only know the higher, more accurate number because of diligent citizens that have taken it upon themselves to tally up the numbers. #2 If ISIS committed a terrorist act in America, it’s likely they would be held accountable for their crimes. Police, on the other hand, have a completely different set of rules to follow. Due to the powerful police unions that influence lawmakers in every town, city and state in the country, police effectively “just do their jobs” while being above the laws that the citizens have to follow. ISIS wants a monopoly on violence and would literally die to have what police in America have; complete control over their subjects so they can instill their definition of morality into the populace through intimidation and fear. Police in America and all over the world, have been involved in some of the most heinous acts of rights violations and crimes against the people they “serve.” Regardless, no matter how many times an individual police department abuses its citizenry, the people are unable to fire their police department. People are forced to contribute their tax money toward the department no matter what. An alternative to this would be hiring private security firms who are not paid with tax money, but rather voluntarily paid and contracted out by the communities that wish to have their services. If this sounds too crazy for you to fathom, and you think “private police forces” sound like they could be like the atrocious Blackwater or other fascist security firms; just think about it for a minute. Blackwater, Craft and other “government” contracted security agencies are just that; they are “government” funded and protected. In other words, they are just like police in the respect that they are paid with tax money and because they are afforded all of the secrecy and impunity of a government backed, fascist corporation. Because they are in bed with government, technically they are not “private” security companies. Dale Brown’s security operation in Detroit, on the other hand, is probably the best example of what true “private” security companies can provide for communities. Bottom line, if you don’t like them, you can fire them and hire a company that better suits your community’s needs. A monopoly on force restricts all other possible solutions that could be provided with true, consumer demanded security companies.